I have been busy riding. Perhaps I watch MotoGP and Superbike on TV a little bit too much so sometime last month I decided to order the new 2008 Kawasaki Ninja 250R. 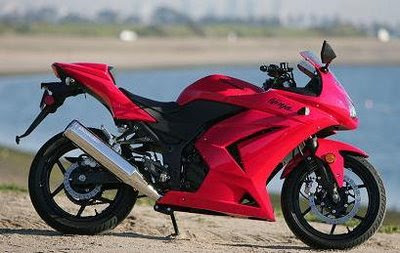 It has only 250 cc and 33 bhp but it’s red, it’s surely pretty and it’s in my garage now. I guess my next step is to learn how to do cornering and trail braking so I know what Valentino Rossi feels every time he does it. But even I’m busy with the new Ninja it doesn’t mean I stop thinking and re-evaluating my life. Since I finished several projects last month I have more time to do so. And when I looked back my last post: 'What Would I Miss?' I feel like I need to add more into it, especially the part when I should compare what I have already had in hand right now and what I may have in the future. I currently work for Cisco Advanced Services team as Consulting Engineer. This is a unique position because I have to act as both consultant and engineer. As consultant when I have to talk to executive to present the brief idea of the design, to learn about customer business in order to understand the requirements truthfully, use my interpersonal skill to build relationship with the customers, and to make the high level design and implementation strategy. As engineer when I have to really turn the design on paper into a working infrastructure, write down the low level design and implementation plan, build the configuration and interconnection in detail, test the interoperability and proof of concept, execute the migration plan to ensure it can be done within the agreed downtime window. So the coverage is beyond consultant and engineer as individual. To add more into it, in some scenarios I must use my leadership skill to set the direction for the team, help the sales team in some pre-sales activities, build deployment approach, assign tasks and manage resources with my project management expertise. In summary, the role is started when the sales team has sold the product to the customer based on the high level requirement and it is time to drill down the requirement to more detail and put all the puzzle to one piece of working solution. And as per my comment above, sometime it is required to be involved during pre-sales process, to help define the scope of work, to verify the Bill of Material before it gets ordered, and to convince the customer that even we have yet to build the low level implementation design and plan but the project can be done and executed seamlessly. Well, those stuff are actually not new to me. I have been doing similar tasks even before I joined Cisco. In fact, if I count since the first day I must work in a team to deliver project, I have already had more than 10 years experience. Indeed, this role is not the same role with those who develop the products. Consulting Engineers are not required to write code. But this doesn’t mean we are not involved in product development! See, we are the one who deploys the products and interact with the customers directly. If someone asks my opinion I would say that Advanced Services through the Consulting Engineers are the one who gets the real world feedback and know the requirements and challenges during deployment and operation of the products. I have seen many people from the team who may not know the language to write the code but have been contributing to product and protocols development. The key here is to understand the architecture of the hardware, software and the protocols by heart. Combine with real world experience and feedback from the field, AS engineers hold the key for the improvement of those and must be part of the discussions. Not everything can be tested only in the lab as normally development team does. And we also have Practice team who normally consists those with extensive deployment experiences combine with heavy lab testing results to provide Best Practices, Deployment Guides and obviously feedbacks to the developer. So even I’m not part of the team who develops the product directly but I still have an important role. And I like to do so. And I have been doing this for many years. Hence I think it’s fair enough to write down What Would I Miss if one day I decide to leave this role. Perhaps because of more money, more challenging roles or higher level position. I need to write this down to make it easier for me in making decision by comparing the new role with the existing that I have. In one life cycle of a product, it starts with the development by Business Unit, then sales team must fit the product specification with the requirement, then Advanced Services must deploy the products and make a working solution. So it’s in the end of the cycle before the customer can really utilize the products. For me, nothing can beat the excitement when all pieces are finally combined together and the design really turns to a working network. It is always good to see a new and shine production network based on my design or migration plan. Some projects can take several months, even years, to complete. But when it does, seeing the happy customers can fully utilize the products and the infrastructure can really give me full satisfaction. The level of satisfaction increases as the project getting larger and complex, and has more components involved. I have been in the worst time and under very high pressure to submit the plan within short time or during limited downtime window to do migration. But once it has been done successfully and I look back I can only laugh happily and wish to repeat the moments. I have disengaged from 8-to-5 type of work since several years ago. I’m a result oriented kind of person so how it is done sometime it is not relevant. And that’s what exactly provided by my existing role. What matters is if the project can be done successfully. The process is good as learning curve but in the end it’s the result that matters. I don’t even have to go to the office since I can work from anywhere as long as I have Internet and secure VPN connection to the closest access server. I can choose my working hours. I can decide to work beyond 70 hours this week so I can deliver as per the target but then work less than 20 hours next week to recover. My role as consulting engineer with coverage in Asia Pacific countries, mostly in South East Asia, also mean I have to travel and do projects in different country. It was fun in the beginning due to the new experience and eventually I feel like getting addicted to it. I like to be challenged with different customer types with different habit. I like to visit new places and work with people from different culture. Due to the close relationship with development team, Advanced Services has more access and privileges compare to other non-developer teams in Cisco. We can read and follow a product or feature development process. We provide feedback from real world experience and we can re-use the information the development team gains from extensive lab testing. We get notified first if the development team finds discrepancy in the code and may impact the deployment in the field. I have also met well known Cisco people since we are normally talking the same language: either we share similar deployment experience or we would like to exchange the real world experience with the knowledge gained during the testing in the lab. I enjoy listening to the discussion when the deployment team explains why and how the new features are developed, as much as I enjoy listening to the other AS team that has deployed the features in the real network and provide best practices and the feedbacks. So I have all those above in hand. They are real. They are what I normally do in daily life. They, currently, are part of my life. Don't worry about trail breaking just yet. Keep on that front brake.